Carbon is one of the most versatile elements: it forms the basis for an enormous number of chemical compounds, it has several allotropes of different dimensionality, and it exhibits many different bonding geometries. For this reason, carbon materials have had a special place in materials research for a long time. Although the three-dimensional forms of carbon—diamond and graphite—are known since ancient times, it took until 1985 before the first low-dimensional carbon allotrope, the quasi-zero-dimensional fullerene, was discovered. 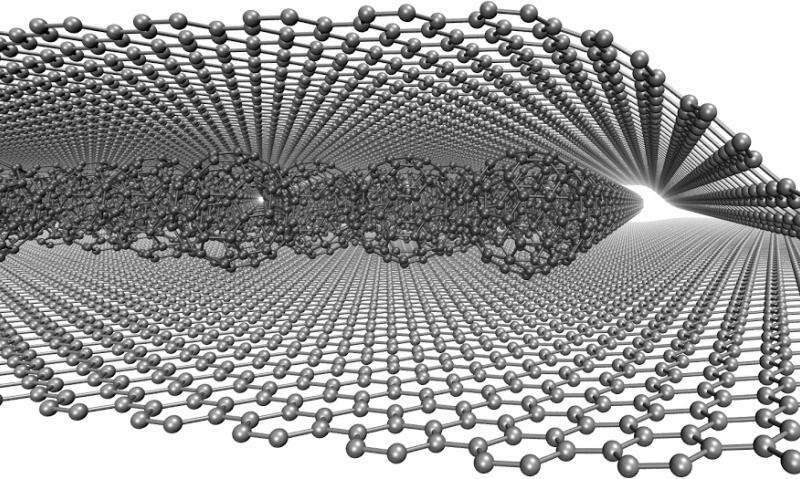 Soon after this, in 1991, the one-dimensional carbon nanotubes were brought to the attention of the scientific community, and in 2004 the two-dimensional carbon allotrope, graphene, became experimental reality. Different combinations of carbon allotropes such as fullerene-filled carbon nanotubes (carbon peapods) and graphite intercalated by fullerenes have been made already. In the article published in Science Advances, the scientists at the University of Vienna demonstrate a hybrid carbon system, termed buckyball sandwich, in which a single layer of fullerenes is encapsulated between two graphene sheets (Illustration 1). The analysis of the structure via atomically resolved scanning transmission electron microscopy provided insights into the dynamics of the molecules. At the edges of the fullerene layers, the scientists could observe the diffusion of individual fullerenes within the pocket of the graphene sandwich (Illustration 2): Due to the movement of the fullerenes, they are only partially visible in the image (recorded line by line, so that mobile fullerenes only appear on some of the lines). Moreover, fullerenes were found to rotate inside the sandwich—however this rotation was blocked when the fullerenes merged into larger objects due to extended electron irradiation. With the fullerene-graphene system, the scientists have created a new material that fills a gap in the available combinations of hybrid carbon heterostructures. 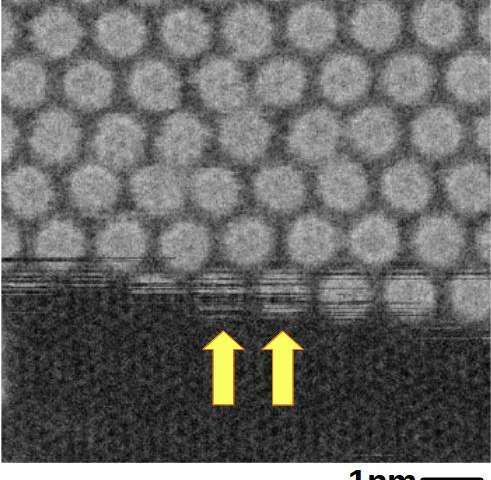 The graphene sandwich provides a nanoscale reaction chamber and a clean interface to the microscope vacuum, that allows the observation of molecular dynamics in the transmission electron microscope. Therefore the researchers expect that this work also opens many new avenues for studying the structure and dynamics of molecules similarly encapsulated in the 2D space between graphene sheets.